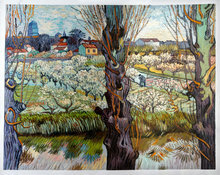 La Crau with Peach Trees in Blossom is one of those paintings Van Gogh made during his trip to Southern France. The picturesque tranquility of this rural location has been captured very well in this. 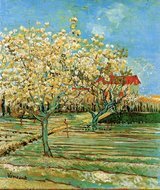 The varied brush strokes and the lighter palette that Van Gogh has used while creating this painting have been studied well by our artists, before giving this masterpiece a try. 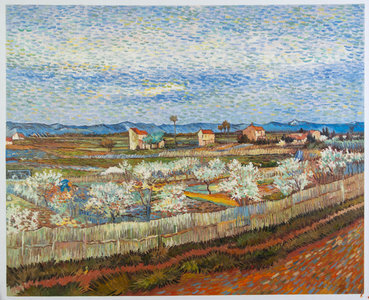 The painting “La Crau with Peach Trees” was made by Van Gogh during his stay at Arles. Many say that this was probably the most creative period of his career. Some of his best works such as Harvest at La Crau and the Still-life painting Vase with Fifteen Sunflowers were made by him during his stay at Arles. 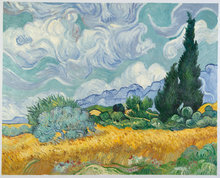 Van Gogh loved to paint the plains outside Arles. This painting was his last view of the plains. When he wrote to Paul Signac, the painter, about this painting, he told him why he was so attracted to the subject. He said it was because everything was small here including the mountains. The blossoming peach trees against the snow-capped peaks of the mountains have given a peaceful, almost tranquil look to this painting.